My wedding was one month ago. In spite of my best attempts to keep it to a minimum budget, I still ended up paying double what I wanted to. I will say that wedding wire was enormously helpful. This free website has a budget tool, a calendar tool, and a checklist. The good thing about the website tools is that they are very flexible. The website wasn't as great about customizing tools to gay couples (I kept getting stuff for brides even though we self-identified as a male-male gay couple up front), but I still used the site extensively. Fortunately for me, we had friends who helped with everything from the music for the wedding to officiating. This saved us money and helped us to incorporate these important people into our special day. I've outlined below how one might choose to do a budget wedding, but still get the things they want. It is important to figure out where your priorities are when planning where to spend money. You can see by my lists what was most important to me/us. We decided that we wanted a beautiful and unique cake that was gorgeous. We chose a more expensive baker because his cakes were the tastiest and prettiest of all of the cakes we saw. We designed our cake and he made our design a reality. His end product wasn't quite what we started with as a picture in our mind, but was perfect for the wedding. The cake was beautiful and delicious. Where you can save money on the cake is to have a smaller cake and then purchase sheet cakes. You only need a cake to cut, not the shaped cake to feed everyone. The second largest cost for us was for our rings. This, in my mind, is where you want to spend the most money. We found a place that made custom rings for us out of gold and exotic wood. We love them, and they happen to be priced reasonably. The other place where you can get rings for a better price is to go to pawn shops. For some people, this is fine. For others, the idea of owning someone else's jewelry as their wedding ring isn't so cool. We wanted something custom and went with it. Although we didn't get super expensive rings, we chose to spend money here. This is the symbol of our marriage and something we will be wearing for the rest of our lives. This was important to us. The largest cost for my wedding was the catering costs. We saved a great deal of money by choosing to use a restaurant instead of a hotel for our reception. We chose a restaurant that isn't normally open on Saturdays for the daytime. We had a morning wedding followed by brunch. Having brunch instead of dinner is really much more affordable. We were able to have a lovely buffet for half the cost of a dinner. Additionally, we chose to only provide champagne to guests and have a cash bar. 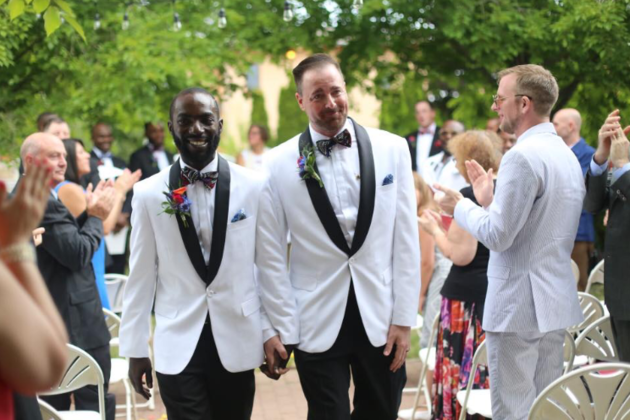 We chose, too, to have the wedding in Rochester, New York. Most of our guests would have to travel for a wedding regardless of location, so we chose one where we had connections and where prices were cheaper. This did limit our guest list (not on purpose) to those people who were willing and could afford to travel outside of the city for a wedding. David and I love to go out to eat. We really enjoy tasty food. We chose a restaurant that was known for super good food. The place we chose has a unique flair to it. They also cooked custom food for us. My parents brought maple syrup from our farm that was served with french toast and the chef made Nigerian Joloff rice to make my husband happy. We chose to have custom bow ties and cummerbunds made for us out of Nigerian fabric. These cost us $600. In fact, they bow ties and cummerbunds cost more than our tuxes and shirts. We also had a cake topper made that was a little statue of us. We didn't use it as a cake topper, but had it next to our cake. The price of flowers shocked me a little. If we had done the wedding where we lived, we would have done the flowers ourselves. Just the boutonnieres for the men and the centerpieces for the tables cost us a lot of money. We chose to rent the vases that held the flowers and to return them the following Monday. This saved us $7/piece. Our minister suggested this and it was recommended highly by most people we talked to. I can't stress enough how helpful it was to go through this pre-wedding counseling. We each did a Myers Briggs test and read through how our different personalities interact in a relationship. 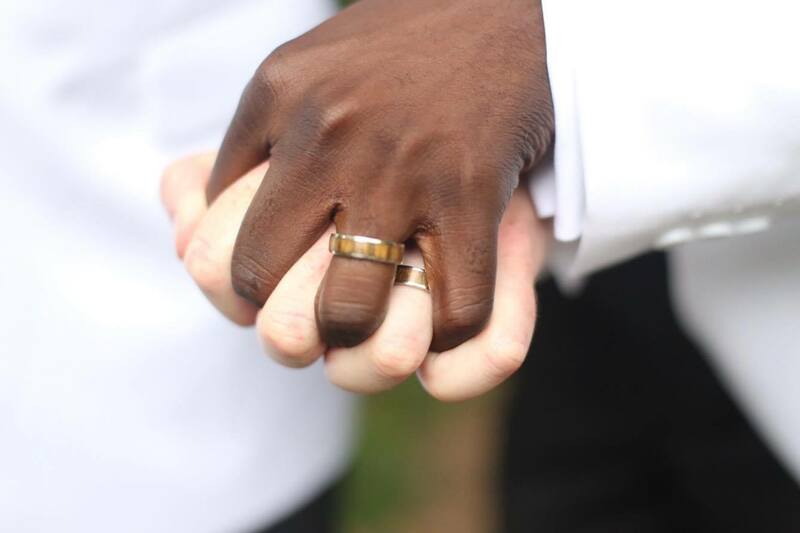 We also wrote a covenant to each other stating what our promises to each other were. This covenant ended up being our vows. We wrote each other a love letter. We also were asked to make a list of the things we saw in other marriages that we wanted in our own marriage and a list of the things that we didn't want in our marriage that we had seen in others. A minister talked us through each piece. This cost some money but was well worth it. We also made our own wedding favors, which made the wedding more personal and was more affordable. I chose to make home-made chapstick and buy little containers and stickers. We also found some Christmas Crackers that were simple and not Christmas in design on ebay that we had at each place. We encouraged guests to open them as soon as they got to their tables. You had to open them as a couple and share the joke inside. It encouraged people to get to know others around them. We wanted people to have a memory of us, but not break the bank making it. For tuxedos, we chose to purchase two inexpensive matching tuxedos from Amazon. We then had them altered extensively. 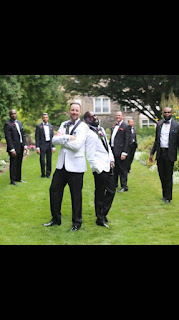 With the alterations and the purchase, the tuxedos ended up being cheaper than rentals for us. 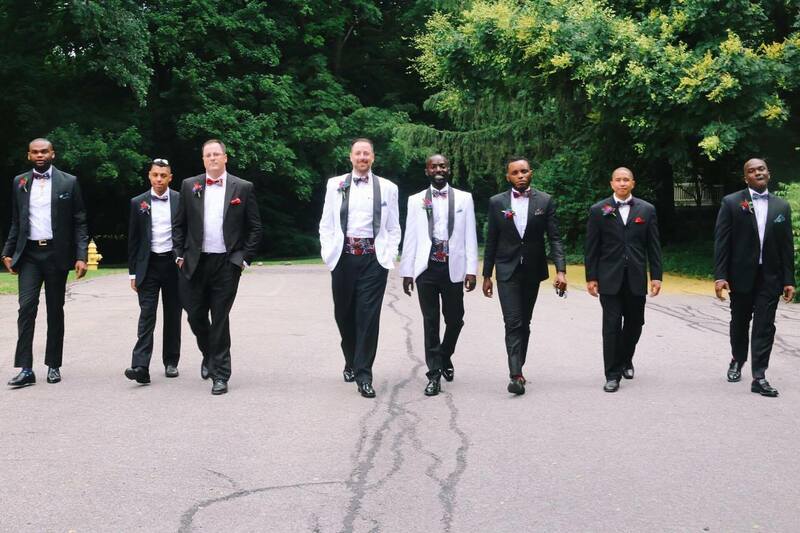 We asked our groomsmen to wear black suits and white dress shirts with black shoes. We provided them with bow ties, pocket squares, and fun socks. This saved them money and people didn't really notice that they were not in tuxes. The catering costs were cheaper at a restaurant than a hotel because restaurants don't have to pay a hotel tax. Restaurants will work with you on a custom menu. We also chose brunch because it was more affordable. Additionally, not having an open bar did save money. We chose a restaurant with a beautiful outdoor patio. We had the ceremony on the patio and had no decorations other than the trees and shrubs. We also selected a restaurant that was beautiful inside and out so that we didn't need to decorate it. The only decoration was the flower centerpieces on the tables. We did not plan on having people dance at our wedding reception. We still wanted music. Instead of hiring a DJ, we put together a playlist on iTunes and just had that playing through a sound system that we borrowed from a friend. They did cue up our first dance song. Other than that, we used our playlist. Some people did dance, but it was mostly just people sitting and talking. We chose to purchase our own video camera for $300 and asked a friend to videotape for us. We didn't want to spend the money on a videographer, but heard loud and clear from our friends that we definitely would want a video of our wedding. Photography is typically one of the most expensive parts of a wedding. This is for a good reason too. Photos are very, very important of your special day. Given our budget, we chose to go with a young college student who was just starting his photography business instead of one of the more seasoned and expensive wedding photographers. His cost was a small fraction of the cost of the others we looked at. We have not seen all of the photos yet, but the dozen that we did see were absolutely stunning. He was wonderful to work with and we can hardly wait to see the photos he took. We took some chances with the weather. We had an outdoor wedding with a rain plan that wasn't great. We also chose to take photos at a place where you usually need a permit, but didn't purchase that permit. We took the chance that it might work and had a back up plan that was free in case it didn't work. We got lucky that it didn't rain (except for one or two drops) and that no one else was at the location where we took our photos. My family and friends helped out a lot. One of my friends who is a minister performed the ceremony. Another friend played the cello as her gift to us. Some friends sang for us. My sister and brother helped set up the reception, ceremony, sound system, and helped make things run smoothly. They took the place of a wedding planner or coordinator. I tried to give them instructions, but they still had to make many decisions on their own. For the wedding and honeymoon, we stayed at friends places who were out of town. We only paid for a hotel room on the night of the wedding. This saved us a lot of money. After looking at limos, we chose to rent an SUV instead. We were given a beautiful, clean red SUV that we used to transport things all weekend. I found a coupon code through plumb benefits which we have at work. If you look for coupon codes, you can find them and save money. It helped that we didn't have to clean our own car out and could use the extra space in the SUV to bring guests different places. We used it to bring the groomsmen for photos too. If you have friends willing to drive and clean out their cars, that would work too. We didn't have that option. For invitations, we chose to have a custom drawing made for us. We used a website called Fiverr where you can pay $5 or more for people to do things for you. We actually spent $100 and had five drawings made for us. We chose our favorite and then put it on the cover of a postcard type invitation. We chose to have people email or call to RSVP instead of using stamps on a reply envelope. We printed everything on vista print which was awesome. 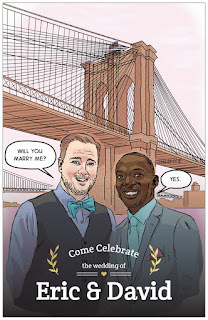 We used their website to design and print invitations, thank you cards, a poster for people to sign at the wedding, and our printed wedding programs. They have design templates, and if you have a problem their customer service line is really helpful. I had recently signed up for the google chrome extension called honey and ended up getting awesome coupons through that for quite a few of my purchases. It is very helpful for vista print in particular. 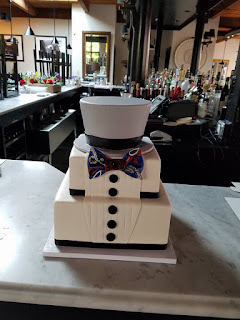 We found a cute box on ebay for our ring bearer, picked up a nice kids tux for him and it was perfect, and had his mom buy him some comfortable sneakers. For the flower girl, we found a nice inexpensive dress online that she liked. We used extra bow tie fabric and made her a headband for her hair and then glued it as a ribbon around a basket we picked up at a garage sale for the flower petals. The local grocery store (Wegmans) sells rose petals by the bag which were much less expensive than a florist. For a rehearsal dinner, we just ordered bbq take out and ate at a friend's house. Our families did not care if we had something fancy. We picked up beer and drinks at the grocery store and had them in coolers on ice. A friend suggested that we sneak away between the wedding photos and reception and just have some time for us. I had a friend who was a chef pack us a special picnic basket as her wedding gift to us. We dropped everyone off at the reception and drove to a little park. We unpacked our picnic and spent just 20 minutes talking, eating quickly, and enjoying each other. This was perfect. We could have done it all day, but knew we had guests waiting. We only ate a few bites of food, but it was enough to keep us going so that we didn't feel starved when we only ate a few bites during the reception. Friends helped us throughout the wedding to make it uniquely us. We had a cake that we designed, flowers we picked out, wedding favors that reminded our family and friends of us, and readings, songs, and prayers that we chose to represent who we are. We wrote our vows and the entire ceremony was only the people we are closest to enjoying the day with us. If you can take the time to pick songs and readings that are not generic, but mean something to you, it will make the day even more special and memorable. Involving our friends made them feel like they were contributing too. I think I would ask that the minister and all of the readers and guests use the sound system that we had borrowed. No one used it and it made it hard to hear for some of our guests and on the video. I would have been more explicit in my directions to our tailor for our bow ties and cummerbunds. We ended up having some issues with them that would have been solved had we communicated better with him. I would have brought a few extra pairs of socks and cuff-links because that is what people forgot. I would have had extra pins for the boutonnieres. They were top heavy and only came with one pin. This stressed me out before the wedding. I would have tried on my tux before leaving Brooklyn to drive to Rochester. I ended up bringing the wrong tux pants which did not fit (we had two pairs of tux pants for my husband and none for me). Fortunately, I had an old tux in the attic of my rental property in Rochester and was able to use those pants). That's my quick summary of what we did to make our wedding more affordable, but still elegant and special to us. What a handsome ringbearer!!.. what a great wedding Eric and David, so happy to be a part of it! It sounds like it was perfect! !